The U.S. and Canada named their rosters for the upcoming World U18 Championships that begin in Russia on Thursday. Former Maple Leaf coach and GM Pat Quinn will coach Team Canada while ex-Terrier John Hynes (pg. 28), coach of the NTDP U18s, will be behind Team USA’s bench. 2008 recruit Corey Trivino (right) was the only non-Major Junior player to be selected by Canada. Earlier this season, Trivino helped Ontario win gold at the 2007 Canada Games, played in the World Junior A Challenge in Trail, B.C., last November and the national Jr. A prospects game in Manitoba in December. His future teammates, Vinny Saponari and David Warsofsky are on the American squad that is almost entirely NTDP program players. The two are the second and third leading scorers for the NTDP U18s. Warsofsky will be the third consecutive NTDP U18 captain to play for BU. Team USA— with team captain Brian Strait , Luke Popko and Colin Wilson—won the gold medal in 2006. Last year, Team USA—with team captain Kevin Shattenkirk and co-leading scorer Wilson—took silver, losing in the final to Russia. Chris Connolly scored his 26th goal in a 7-1 Omaha/USHL win. Incoming recruit Grant Rollheiser is spending some time as a goalie instructor before enrolling at BU this summer. The Spruce Grove Saints’ AJHL playoff run ended in the semifinals with a loss to Ft. McMurray, but Kieran Millan, BU's other goalie recruit, was a standout for the Saints throughout the post-season, posting a 2.19 GAA and a .923 save percentage in 15 games. Millan earned his team’s star of the game in several of the games with Ft. Murray, including a double-overtime loss in which he stopped 48 of 51 shots. 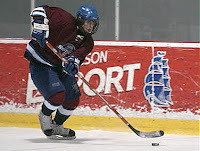 USHR reported that BU, along with BC, is interested in 6'2" Avon Old Farms defensive defenseman Brendan Rempel for 2009.